“This all-levels workshop is a great opportunity for artists who are looking to hone their performance or theatre creation skills, and/or interested in creating social justice-minded theatre. 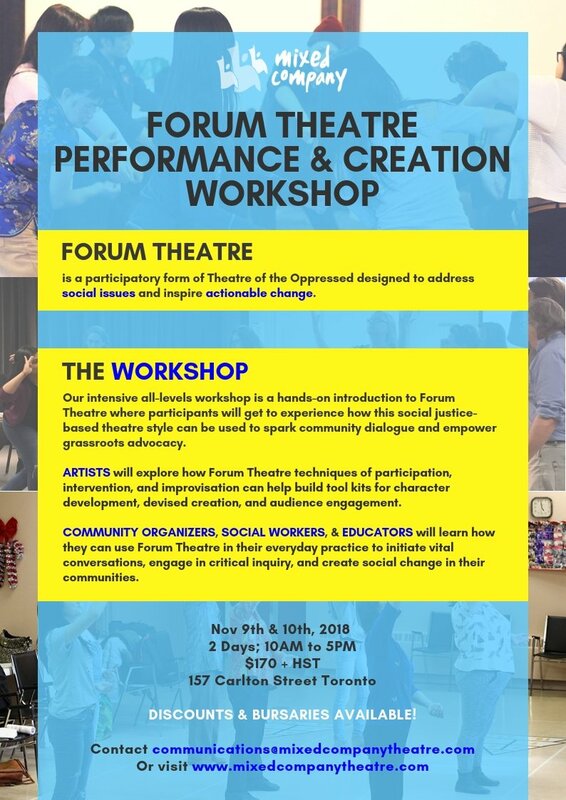 Forum Theatre is also a great tool for educators, mental health professionals, and any or all practitioners of community engagement for facilitating conversations, critical inquiry, and action in their respective communities. Based on the principles of Theatre of the Oppressed, our intensive 2-day workshop will give participants an introduction to the artistic practice of Forum Theatre and how it can be used to inspire and empower community dialogue and grassroots advocacy.